Welcome to Far Home Hostels! – High quality and economic price Hostels in Madrid. 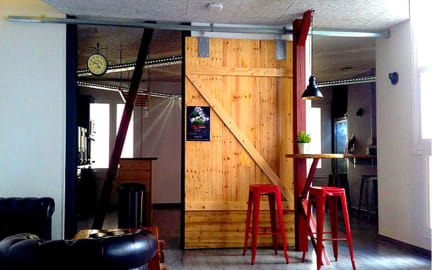 Far Home Atocha is a stylish and modern design hostel with patio terrace, common area and conference room. The modern rooms come with free WiFi connection, desk, individual lockers, air conditioned either a private or shared bathroom, and some of them have a small balcony. Located on Calle Atocha, in Madrid City Center, just 250 meters from Plaza Mayor Square and 300 meters from Sol Square. Check in from 14:00 to 07:00. Breakfast not included - 5 EUR per person per day. Breakfast is available from 8:00 to 11:00. A deposit of 10 euros for person will be required on arrival which will be refunded if no damages were made on check out. The lockers need padlocks to be closed, so our guest could bring their own padlocks or buy one from reception. the hotel staff who is young guy stole my wallet. Do not use this hostel!